A tiny tube is passed through the nose or mouth into the eustachian tube, which connects the ear to the back of the throat. The procedure is performed under a general anaesthetic, although there is no pain at all after the procedure. The catheter is passed into the eustachian tube, guided by an endoscope in the nose or in the mouth. A 2 cm balloon at the end of the catheter is inflated for 2 minutes, and then withdrawn. After waking up, most people are able to return home within an hour. They will need someone to drive them home following the sedative effects of the anaesthetic. It may take two or more weeks before the ear begins to clear. During this time, eustachian tube exercises ("equalising" or "popping the ear") are performed regularly. Scientific papers published so far, show that up to 50-70% of adults with long term eustachian tube problems, who are only able to be treated by different forms of grommets or other surgery, may benefit. Two randomised controlled trials are planned, but results of these trials may not become available until 2020 or so. Until then, we have less reliable cohort studies which compare treatment with eustachian tube balloon dilation with historic expected outcomes. 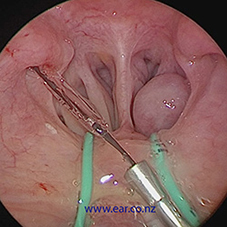 Most adults who I see with long term problems with their eustachian tubes, have only standard or long acting grommets as an option for treatment, or alternatively, extra tympanic (sometimes known as sub annular) grommets. While these all work well, treatment needs to be repeated, often on an annual basis, and there is always the small risk of leaving a perforation in the ear drum when the grommet extrudes. While the development of a perforation may then mean no more grommets would be required (because , in effect, there would now be a permanent grommet), there is always some hearing loss associated with an ear drum perforation. In addition, with a grommet or a perforation, the ear is not "waterproof"-- with attendand risks of ear infection or discharge associated with swimming or water exposure. The only side effect reported so far is the temporary (days) development of air in the soft tissues of the neck. This seems to be extremely rare with only 2 or 3 cases reported out of 17,000 dilations performed using one style of balloon. Minor, temporary bleeding from the nose may occur, and occasionaly an ear infection may occur afterwards within the first two weeks. The main problem so far is that insurance companies may not cover the cost of the procedure yet, while they await full results of randomised controlled trials.